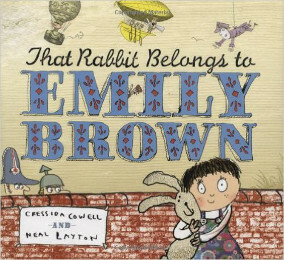 Emily Brown is having adventures with her rabbit Stanley, and keeps getting interrupted by representatives of the queen, who wants Stanley for her own. There’s enough repetition in how the story is constructed that it held my kids’ attention even when they were younger than two, but there is enough going on in the story that my new kindergartner still loves to have this story read to her. This may be my husband’s favorite picture book. He loves this book, and we have actually had in depth conversations about what it means. He’s certain that the queen in the story is a really Emily Brown’s mom, who is sending the dad to retrieve a beloved stuffed animal that has gotten grotty and needs a wash. I can see his point, but then wonder about the ending, which doesn’t really fit with that theory. Yes, we’re doing textual analysis on a picture book. And it actually stands up to it, because it is a really well-written story. It is definitely one of the books we won’t be giving away as the kids outgrow it!